You will be given a reference e-book to read which has 957 pages And the test will be based on that e-book , you can take final test within 1 year of purchase. Therapeutic exercises refer to bodily movements that are mainly prescribed as a means of correcting impairment, maintaining the wellbeing of patients and improving the proper functioning of one’s musculoskeletal system. It should be noted that these exercises vary based on the chosen activities that are restricted to certain parts and muscles of your body and other extremely vigorous activities that will let a convalescing patient return to its best physical condition. A lot of experts also define a therapeutic exercise as a type of exercise which is planned and executed as a means of achieving a certain physical benefit including the successful maintenance of your body’s range of motion, increasing the flexibility of your joints, improving your respiratory and cardiovascular function and strengthening all your weakened muscles. It should also be noted that all therapeutic exercises that primarily aim to achieve and maintain physical fitness usually fall under major categories including flexibility training, resistance training and endurance training. The benefits of therapeutic exercise are also very remarkable and these include enabling ambulation, improving coordination, respiratory capacity and circulation, mobilizing joints, releasing any contracted tendons, fascia and muscles, promoting relaxation, reducing rigidity, improving balance, boosting muscle strength, achieving and maintaining a higher level of maximal voluntary contractile force and enhancing one’s performance when it comes to performing exercises and endurance or functional capacity. 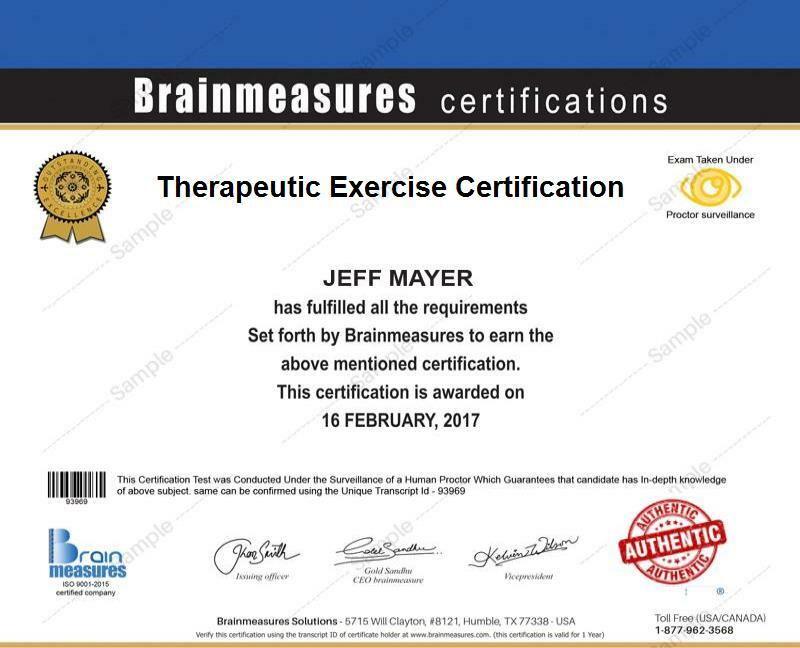 One of the best health-related online certification programs available at Brainmeasures is the therapeutic exercise certification program. This therapeutic exercise course is proven to be really amazing considering the fact that it was developed with the help of real professionals and experts in the field of therapeutic exercises. Enrolling in this program gives you the chance to undergo a therapeutic exercise training which is a huge help when attempting to understand everything about therapeutic exercises, how each of them work, their individual benefits, their scope, how each of these exercises are performed and the specific people who can greatly benefit from performing these exercises on a regular basis. You will definitely enjoy the results of enrolling in this certification course and receiving your certificate since it allows you to easily prove your skilfulness in the therapeutic exercises field. The therapeutic exercise certification program offered by Brainmeasures can help numerous professionals especially those who are part of the physical therapy and medical industry when it comes to performing their jobs even more effectively. The program specifically targets physical therapists, occupational therapists, athletic trainers, exercise physiologists, personal trainers, conditioning and strength specialists and anyone whose work involve the execution of therapeutic exercises. Your chances of earning an even higher salary can also be increased after you receive your therapeutic exercise certification. Holding a therapeutic exercise certification allows you to effectively and expertly work as a physical therapist which entitles you to receive an average of $86,000 per year. Working as a therapeutic exercise consultant is also rewarding because you get the chance to receive around $64,000 to $129,000 yearly from it.